Overhead travelling cranes, providing full hook coverage of the entire manufacturing area, will always be the backbone for lifting and transportation in manufacturing and stockholding and remain an effective means of servicing an entire factory bay. However, there are many situations where reliance on overhead cranes as the sole means of moving or manufacturing product can cause process inefficiencies. This may arise where there are localised workstations operating a high frequency of lifts appreciably below the main crane capacity. Also, it may arise in moving product through the bay where the operator has to wait for the main crane or leave the workstation to bring in the crane. The lack of localised handling for loading and unloading capital intensive plant - such as machining centres - can also lead to extended cycle times and under utilisation of these assets. In all these cases supplementary, localised handling, will improve productivity, cycle times and the return on investment. There are a number of options available. Fixed chain hoists will meet the need for fixed position lift and drop. Chain hoists on track beams or monorail add lateral movement to this function and light cranes extend this capability to give double axis movement. For heavier lifting slewing jib cranes can be specified. Chain hoists and light mono rails Auto/marine workshops, loading bays and lifts between floors are typical situations where a fixed position eye suspension chain hoist provides useful vertical axis movement. Street Crane Company's chain hoists are available in capacities up to 5t, but entry level models rated to 0.125t meet lower capacity handling needs. For lateral movement the chain hoist can be supplied with a trolley on a light beam or mono-rail. The rolling resistance of a chain hoist in this set up is typically 1% of the load and so manual rather than motorised trolley movement is often sufficient. Light crane systems Light crane systems provide complete access to the work area with full vertical movement with x and y movement in the horizontal plane. 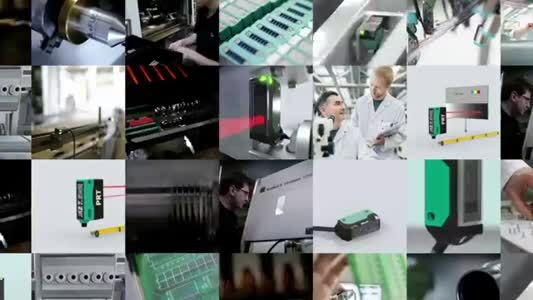 The work area may be a production cell or workstation or, indeed, a single light crane system may service a series of workstations allowing product to be transferred easily down the line. Light cranes will be used for lighter movement and assembly operations, maximum loads are typically to 2t. The beams used in light crane systems are roll formed light steel sections that have good rigidity and an exceptional strength to weight ratio. This means they impose minimal load on the building frame. Light weight floor standing gantries can be provided where attachment to the existing structure is not possible. Various beam and trolley configurations are available depending on operational or site requirements. Underslung hoists on single beams will often suffice for light assembly operations. For heavier lifts, or situations where height restrictions require the hoist to be raised above the beam height then double beam configurations are more usual. Slewing jib cranes Jib cranes are typically used for localised lift and travel in loading machines, servicing welding bays or loading conveyors and floor travelling trolleys. They fit into the handling picture somewhere between light cranes and workshop cranes, handing loads in the 125kg to 5t range. There are two main jib crane configurations, pillar/post mounted or wallmounted. Depending on where it is located in the workshop, the boom of a postmounted jib crane may rotate up to 360Â°. Static wall mounted jib cranes can sweep almost 180Â°. A variation on the wallmounted jib crane is the travelling wallmounted jib crane. This can service a far greater workshop area giving far greater flexibility. Jib cranes can be fitted with chain hoists for lighter handling or wire rope hoists for loads at the heavier end of lifting. Floor structures need to be sound or, if necessary, reinforced for post mounted jibs. Structural frames or custom made steelwork must be sufficiently robust to accommodate the loads imposed by wall mounted jib cranes. Design for purpose Whatever the handling need, it is important to select the right crane for the purpose. 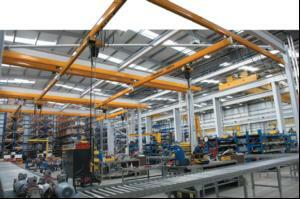 Crane systems need to be carefully specified to meet both current and future production demands. Often a combination of traditional overhead cranes and lighter localised crane systems will provide the ideal flexible solution, permitting efficient use of capital and manpower resources.